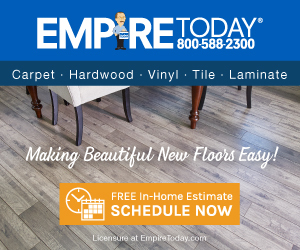 Empire Today - Worst Flooring Company EVER!!! We are disappointed to hear that your product did not meet your expectations. Our records show that we have been in contact with you since your last posting. If you continue to have questions please contact us at customersupport@empiretoday.com. I have used Empire twice (because I believe everyone deserves a second chance) but both times my install jobs were a nightmare! The first time a couple of guys who spoke no English showed up in a beater truck with Washington plates at 9 AM--and at 9 PM they were still trying to figure out how to lay the tile!When the job was finished the tiles didn't match up and they had glued cheap plastic edging over my existing baseboards with a reddish adhesive smeared everywhere--it looks a mess. Years later I thought I'd try them again for carpet--after all--how hard could that be? The first day they showed up and tore out all my old carpet only to discover they didn't have enough new carpet to do the job! The second day they showed up, threw the stuff down and took off in a rush--with a half-*** install job which is now lumping and sliding down the stairs! I called customer service and they sent someone out who told me it had been installed incorrectly over the wrong padding and the whole job would need to be redone. Three weeks later--no word from anyone. I call again and I am told by some snippy little customer service girl that the notes say the problem was caused by "pet damage" and they aren't going to do anything about it!!! I asked her if anyone bothered to look at the pictures and maybe notice the problem has nothing to do with "pet damage" and she says she will call me back the same day--a week later still not a word! I am now going to report this to the BBB because Empire's customer service is the worst and I am stuck making monthly payments on carpet that looks terrible! STAY AWAY FROM EMPIRE TODAY! That's the jingle their commercials should use! I liked: Quickness of install. Review #938786 is a subjective opinion of User938786. We are disappointed to hear that your product is not meeting your expectations. Your concerns are important to us and we will be following up with you soon to learn more.